Roland has created a product that punches above its weight with regard to features, appearance and sound quality. It blends seamlessly into any environment and provides a clean, crisp sound that is hard to beat. Roland F-140R claims to integrate into modern life, and that may just be right. The sleek, elegant and compact design fits easily into any space. With the leading technology we’ve come to get accustomed to by Roland, you definitely expect to get your money’s worth with regard to sound performance from this compact instrument. Let’s see if that’s true. The sound is rich and full. Optional 3D Ambience headphones deliver a fully immersive sound experience. Built-in rhythm accompaniments provide a backing to the chords you play. With Bluetooth and USB connectivity to music apps, using a tablet or a computer allows recording and subsequent composition changes that actually help you improve your piano playing skills. 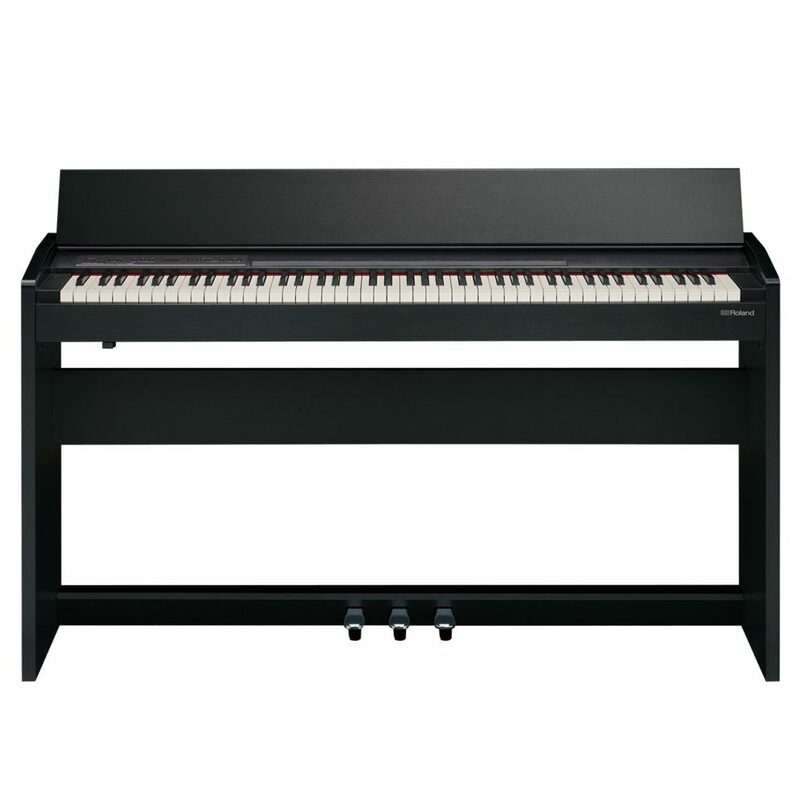 The Roland F-140R, and the entire generation of home-style pianos that it’s part of, has seen improvements in speaker quality, as well as keyboard action. Specifically, the novel PHA-4 88-key Progressive Hammer Action takes the keyboard to the next level. Usually sold under $1500, the Roland F-140R is available in two Rosewood finishes (black and white). And you get what you pay for: Roland’s revolutionary technology and an aesthetically pleasing addition to your home. The returning lid serves to completely cover the keyboard protecting it adequately from dust and actually adding to the visual appeal of the design. While open, the lid provides a music rest for a four page score or an iPad. The housing is functional and sleek, comprising a wooden stand and metal pedal system which includes soft, sostenuto and damper functions to stop and start the accompaniments hands free. This digital piano produces a very real piano experience. Despite not being acoustic, it has a very ivory feel under your hands. The Escapement mechanical function is a lovely addition considering they are not usually part and parcel of pianos in this price range. The perfectly weighted keyboard and high velocity processing capabilities allow faster transitions and note repetitions which will appeal to professionals. The sound emanating from this piano is very natural, pure and expressive. This combined with the dynamic range and volume, definitely outclasses the others in its range. Another perk to this system is the Dual/Split mode which allows layering of the keyboard into two zones, used for different sounds. This helps create a completely rounded sound experience with the multitude of tones available. This mode can also be leveraged to create unique songs by combining the Rhythm sections with the split keyboard to play along with and even record. Teachers will enjoy this feature and exploit the Twin Piano mode which splits the keyboard for alongside playing. A built-in metronome helps keep timing flawless. Roland has created a product that punches above its weight with regard to features, appearance and sound quality. It blends seamlessly into any environment and provides a clean, crisp sound that is hard to beat. The Roland F-140R is the latest, and possibly the best, in a string of great products from this leader in sound technology, bringing us a multi-purpose instrument that not only looks good, but sounds remarkable.